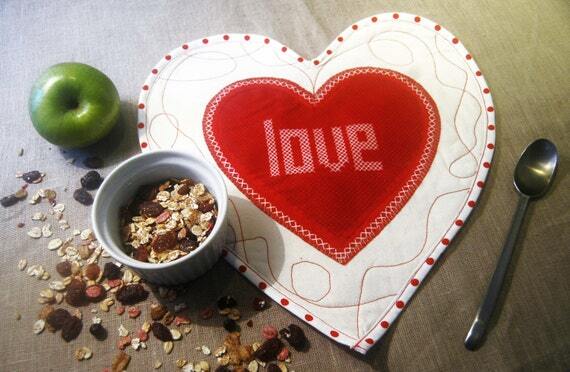 Show your love, with unique, one of a kind fabric art potholders/mug rugs in this heartwarming “Flowering Love” theme. For the romantic, there’s nothing more delightful or cherished than loving sentiments (and they last much longer than flowers). If you have a custom color in your kitchen or does she have a favorite thing, let us know and we can offer suggestions and even work to match it. 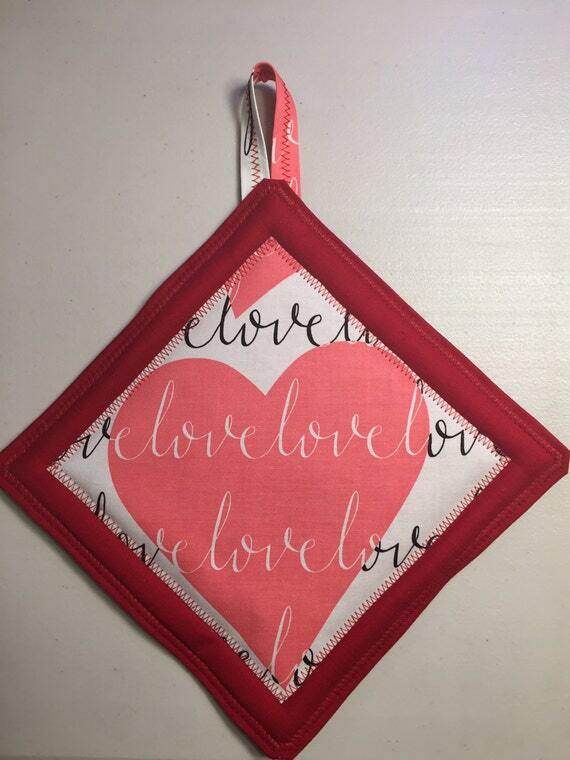 Show your love, with unique, one of a kind fabric art potholders/mug rugs in this heartwarming “Loving Hearts” theme. For the romantic, there’s nothing more delightful or cherished than loving hearts (and they last much longer than flowers). Multiple feature pictures invite you to mix and match. If you have a custom color in your kitchen or does she have a favorite thing, let us know and we can offer suggestions and even work to match it. Be sure to indicate which size heart you would like: small, medium, or large. What a great little gift – stocking stuffer, shower gift, or first home gift! 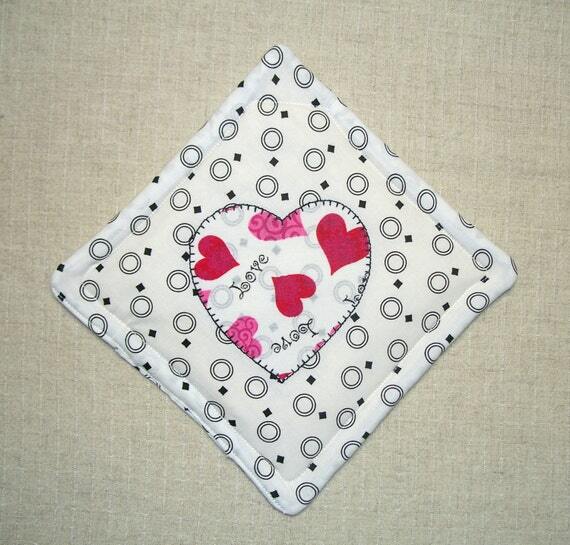 This heart is machine appliqued with a blanket stitch to the fun black and white fabric. There are 5 layers to each hotpad – the 2 outer layers are the pretty cotton fabrics, 1 layer of cotton batting, 1 layer of cotton flannel, and 1 layer of Insul-Bright, which is a heat resistant product, perfect for hot pads! Easy care – machine wash and dry, but avoid chlorine bleach, please! Only use the neoprene side to handle hot items. Heat will damage the image and text. Do NOT use as a trivet. Potholder is well-made, with layer of batting and a layer of “Insul-brite” to protect your hand from hot pans or dishes. Potholder is completely washable, and will keep its shape after washing. 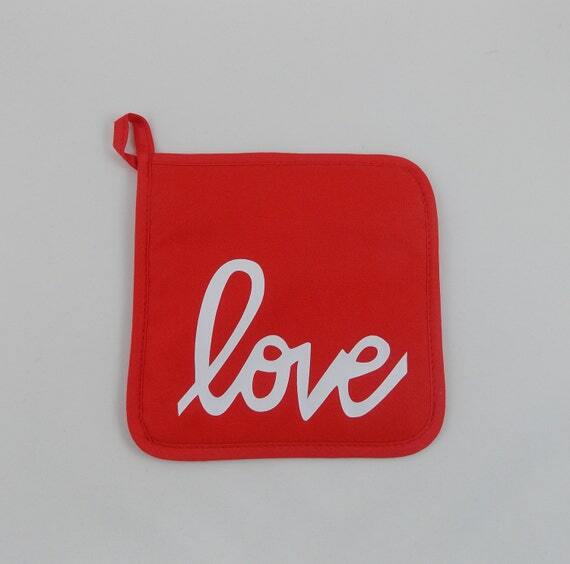 –Small potholder is 7¼” (18.5 cm) long; and 4½” (11.5 cm) wide. –Large potholder is 10½” (27 cm) long; and 6½” (16.5 cm) wide. 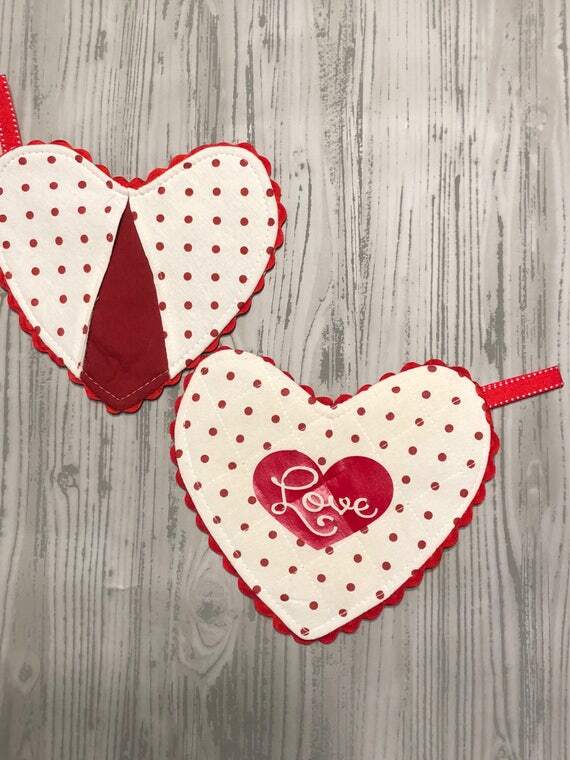 Adorable red and cream polka dot pot holder that says Love in a red heart. A perfect accent in the kitchen and way to handle the pots and pans while hot…. yet still being cute! When washing hand wash and low heat dry. These are sold individually buy 2 for a set! 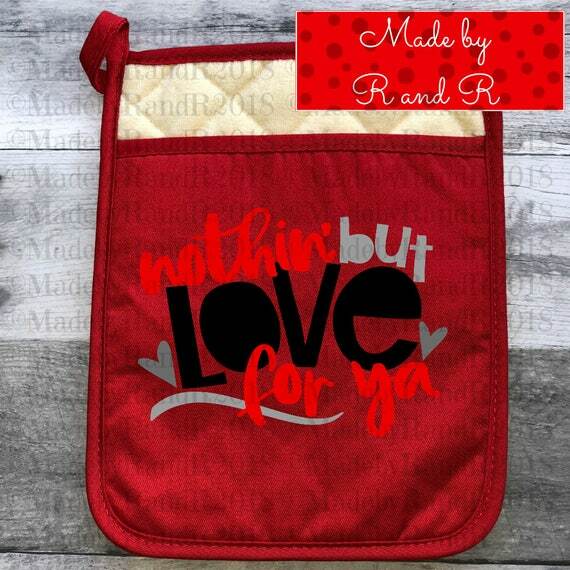 Our “Nothin’ But Love For Ya” pot holder makes the perfect gift for that special someone this Valentine’s Day. 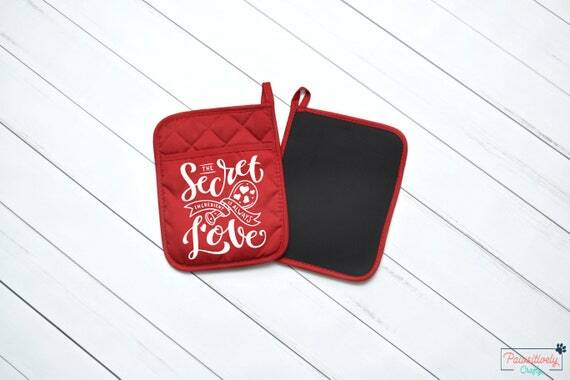 Embellished with vinyl, this cute red pot holder makes removing those hot pans out of the oven much more fun! You can always add a small pouch of cookie mix and a spatula to the pocket to make it a complete gift. When it comes to kitchen essentials, safety is the number one priority. 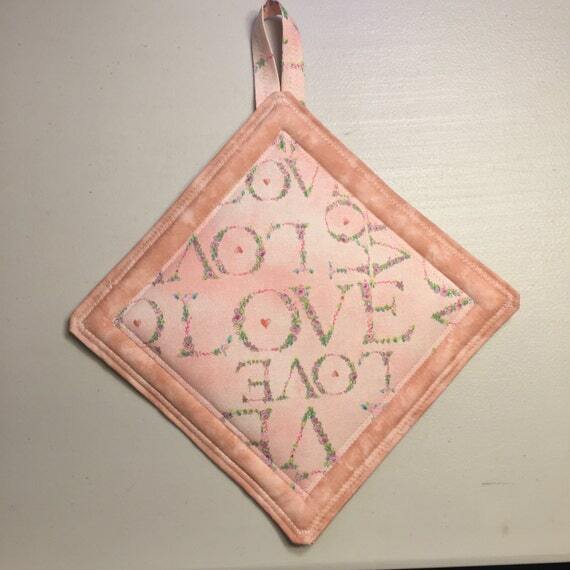 These pot holders have a quilted cotton front with a neoprene pad on the back. In conjunction these protect the hands and wrists from getting burnt, but also serving as a safe place to rest a hot pan on. 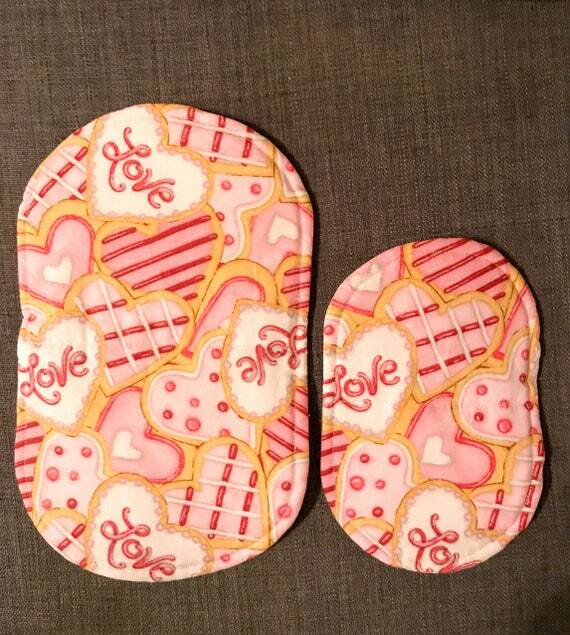 On the front is a pocket, to store various items, such as cookie mix for a gift or a kitchen towel. The pocket also allows for it to be used as an oven mitt. These pot holders are simple to store by either laying flat in a drawer or hanging with the loop at the top. > NOTE: Hot pans or objects should be placed on the neoprene pad side. > NOTE: Color, Size, and placement may slightly differ from photo. 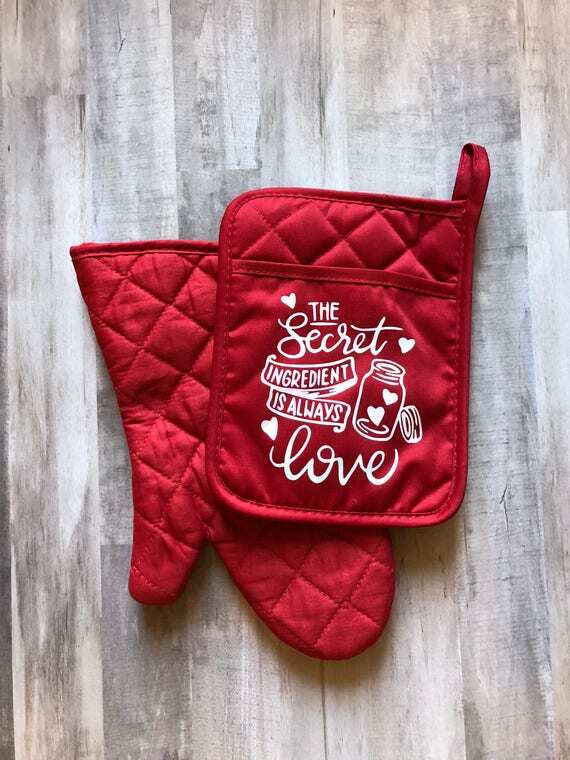 This adorable Pot Holder and Oven Mitt set is the perfect Valentine, Housewarming or just Neighborly gift. Stuff the Pot Holder Pocket with cookies, sprinkles and so much more! Easy Peasy Teacher Gift or for yourself! 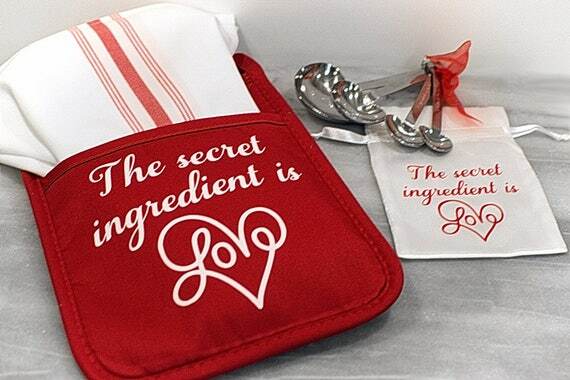 “Love is the Always the Secret Ingredient” is applied with Heat Transfer vinyl and okay to through in the wash!